Reach out to the experienced HVAC maintenance contractors who can tell you about great options! If it’s time to replace your thermostat, we have some good news: you have many different smart devices to choose from! Whether you want a standard thermostat or one with more features, including remote access, we can let you know what’s available today. Contact us for quality thermostat service! Contact us to get your thermostat checked in Southern California! The right thermostat has the ability to save you money, keep you comfortable, and make sure your home remains your favorite place on earth! On the other hand, a broken thermostat can mean you are constantly running five degrees (or more) too hot or too cold. 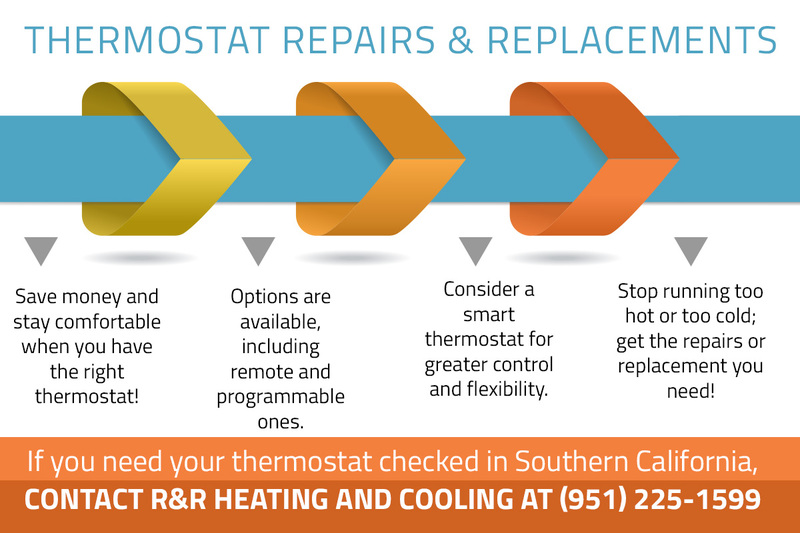 At R&R Heating and Cooling, we want you to be able to control the comfort of your home at all times, which is why we proudly offer both thermostat repair and replacement services to Irvine, Temecula, Palm Springs, Anaheim, and other great Southern California communities. A faulty thermostat can be costing you in extra energy consumption and higher monthly utility bills, when in reality, it’s completely unnecessary. 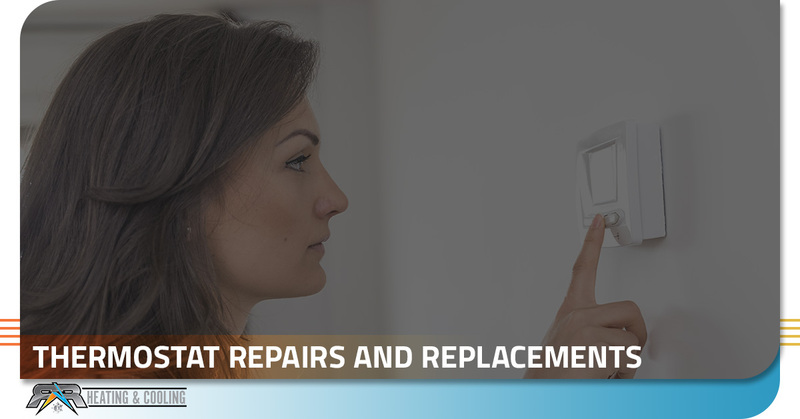 A minor repair may be all that it takes to lower your monthly bills. Or, an affordable thermostat replacement can give you the comfort you currently lack. Either way, it’s such an easy, simple, and inexpensive fix. In return, you gain savings while increasing everyone’s comfort, whether at home or in your business. Should you decide it’s time to upgrade to a smart thermostat, we have you covered there, too. Smart thermostats have simple controls that make programming your home’s temperature — at all hours of the day — easy and intuitive. These thermostats can even learn your temperature preferences and adjust your home accordingly. If you choose to have a smart thermostat installed, we at R&R Heating and Cooling can walk you through the various functions and programmable features so you can enjoy everything this product has to offer. Of course, if you’re comfortable sticking to a simpler programmable thermostat, we understand, and we’ll be happy to help you with that, too. These thermostats are much more affordable, and with careful planning, they can help you save money on your energy bills as well. 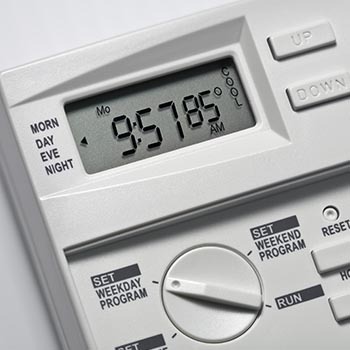 Also, older HVAC systems sometimes cannot connect to a smart thermostat, so sticking to a programmable one may be the only option if investing in a whole new HVAC system is out of the question. Whatever you decide, our courteous, knowledgeable HVAC technicians will do a top-quality job with the installation, and they’ll guide you through the features so you’ll know exactly how to use your new thermostat. To find out what the best option is for your HVAC system, please contact R&R Heating and Cooling at your earliest convenience. Our professional HVAC contractors are highly experienced with diagnosing and repairing heating and cooling systems, and they will closely examine your home’s current system and suggest what you may need to maximize your comfort. If you’d also like to improve your indoor air quality, we can help you with that, too. Give us a call to schedule your appointment with one of our licensed professionals today.